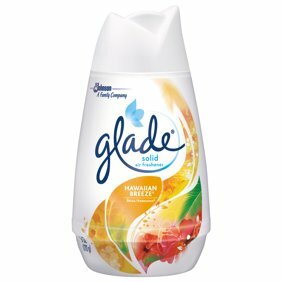 (6 Pack) Glade Cone Air Freshener, Hawaiian Breeze, 6.0 Oz. Keep your home smelling fresh with Renuzit Pearls. Great for continuous freshness in your home. A combination of complimentary scents that surprise. Lasts for 30 days of fragrance. Keep your home guest-ready with an assortment of fragrances to choose from. Instructions: Directions:1. Remove decorative lid, peel back seal & discard.2. Place lid on jar & twist tightly. If swallowed, give glass of water or milk and seek medical advice. Contact with product may cause eye or skin irritation. If eye contact occurs, flush thoroughly with water. If skin contact occurs, rinse area with water. If irritation persists, seek medical advice.For home fragrance use only.Use with care around birds and other sensitive house pets.Do not dispose in drain. Product will shrink as fragrance is released. LOVE THIS PRODUCT!!! Absolutely love the scent and the attractive packaging. These "beads" are so much more effective than the ancient Gel room deodorizers. Very effective, little more money but worth it. Smells really strong at first! Hope the strong scent lasts! I am insane for the scent of your Fresh Lavender adjustables! I love how it fills the room with an incredible smell I cannot define, have never smelled anything like it before. I always have more on hand, and open a new one as soon as the current one starts getting smaller. Please don't ever stop making this "flavor"!